After a lot of years of trying to make it work out, I finally saw a baseball game last week with my old friend, Ben. It might not sound so special, but it ranked right up there for me among special baseball memories. Ben's dad, a lifelong Chicago Cubs fan, passed away a number of years ago. As a way to honor his father and retain a special connection, every year on the anniversary of his father's death Ben catches the Cubs game, no matter where they are playing. As he put it, rather than being overwhelmed with sad feelings its actually a day he can look forward to, knowing that he'll feel extraordinarily close with his dad. In recent year's this closeness has taken on a deeper meaning as Ben's daughter is now old enough to accompany him and his wife to these baseball games. Even though she never knew her grandfather you can still see a very special connection being formed. Depending on where the game is being played, Ben and his family (and friends who are able to join him) are invited on to the field before the game. Other times, the scoreboard might welcome "Friends and Family of" Ben's father. While all that is greatly appreciated and contributes to warm memories, I get the sense that its extraneous to Ben's experience. For him, those three hours in the stadium are precious time that is carved out each year to spend with his father. For years I've been hoping to join Ben for his annual outing, but something or another prevented it from happening. This year, when I found out the game would be in my new home town, I was incredibly excited to join Ben and his family. And I truly felt honored to be there. Our time was spent talking about baseball, catching up on family and friends, discussing jobs, etc. Nothing unusual. We talked a little about his father, but that wasn't the focus. It was enough to experience the connection - the almost spiritual space that Ben carves out each year. It really was a privilege to be able to join Ben and his family, and I've already marked off the date for next year. And its not just because I got to go on the field for batting practice - though that was pretty cool too! But we definitely have found ourselves to resorting to asking him to amuse himself with the iPod when no other distractions seem to work and we need to be doing something else. 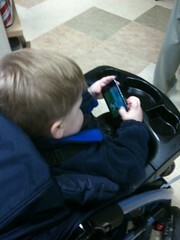 It's not just the little toddler games, but he also likes to browse pictures of himself and people he knows. And given that frequently sharing pictures of faraway-relatives is one of the recommended strategies for coping with mobile and geographically-dispersed modern families, I console myself with that a little bit, too. We disable the net connection when he has these devices so he can't inadvertently send someone email. That's what I tell my kids - and myself - whenever I leave on a work trip. Speaking on the phone from far away places, I reassure them that "Mommy is coming home on Friday." Or "in two days." Or "tomorrow!" I travel for work three, sometimes four, times a year. Mostly for five days or less, occasionally more. Usually to Europe and other developed world destinations. I miss my husband and kids a ton while I'm away, but I also enjoy the luxury of focusing only on work and the pleasure of escaping my working mom juggling act for a few days. It's complicated, but my comings and goings usually are relatively simple. I get on a plane and fly away. And then, magically, Mommy's home! Well, "magical" doesn't really describe getting groped at the security screening and smacked by someone's carry-on luggage. But you know what I mean. Generally, I arrive home within a few hours of estimated landing time. But not last week. Iceland's Eyjafjallajokull Volcano erupted and exploded my travel karma. If you didn't follow the flow of ash that shut down European airspace for almost a week and grounded nearly 9 million travelers worldwide, here's a link to The New York Times' stories about the largest closure of commercial airspace since World War II. I was stuck in Paris. I didn't quite get that. Plus, despite my uncertainty as a new Mom, I always thought I knew better. I figured once I mastered the diaper changes and the fever control and the formula-mixing, I’d be a pro and we’d all live happily ever after. Learning to change a diaper was perhaps the easiest thing I have done in my 12+ years as a parent. Once we learn how to change the diapers, we never have to learn again. We never have to second-guess ourselves, wondering if we fastened the diaper correctly or applied the rash cream well. We know. It works. And unless there is some defect in the diaper itself, that’s all she wrote. From the moment we first become parents, we are teaching our kids while still learning ourselves: The right way. The wrong way. The best way. The easiest way. The Way. We teach them all the things that work or happen a certain way: How to put toys away, brush and floss, say “please,” say “thank you,” say “excuse me,” put on pants, take off pants, pee, poop, wipe, use a fork, solve math problems, brush their hair, brush their teeth, floss their teeth, call home, call Grandma, lock a door, unlock a door, get all the shampoo out, blow their nose, use a straw, write with a pencil, erase with a pencil, dial a telephone, turn the TV off…..and the list goes on. We teach them stuff that has a beginning, middle and end. Stuff that gives us an easy, neat or acceptable way of doing it: Do it this way and it will work. It’s been proven. You can’t mess up. Just trust me. End of story. I've never been much of a dieter. For me -- and I know this is not the case for most folks -- dieting is a set up for failure. Telling myself I absolutely cannot eat that one thing over there will result in my eating that one thing over there. All of it. And then I will lick the bowl. Instead, I try to eat well on a regular basis -- lots of whole grains and vegetables, beans, not a to n of meat and cheese -- and I don't usually invite dessert into my house. But sometimes I ignore this rule and make dessert so that I can crowd out much higher-calorie options. Dessert is omnipresent. It's at the office party, it's at the neighborhood BBQ, it's at the day care fund raiser. And if I've turned it down three times in a day, I'll give in the fourth time. So I need something in my back pocket that will push me past the oh-so-bad-for-me ooey-gooey, creamy, yummy bites. If I do it right, the dessert I make will not only satisfy dessert cravings, but give me incentive to stick with the healthy veggie salad, fruit and yogurt I brought for lunch. I've had this banana bread recipe for ages and find that with a couple tweaks, it serves this purpose perfectly. It's written on an index card and I don't know where it came from. Doesn't matter -- I've altered it a bit over the years to make it a bit more interesting and nutritious.